What an amazing day here in the UK, the sun is shining and summer is truly here! The pictures start after 14 seconds and I must say it is an excellent video and Nigel Hemming himself said he loves it and is very flattered that someone has took the time to make it. So we have a little COMPETITION for you, the person who can name all the titles of the pictures in the video will win a small, signed, Nigel Hemming print. Please use the email address on the blog to submit your entries or through a comment on this post; we may decide to award the person nearest to naming all the titles, if no one gets them all right! Stay tuned for some exciting Nigel Hemming news and new releases. Our good friend Nigel Hemming has produced another superb image, which was released this month at Crufts Dog Show 2009. 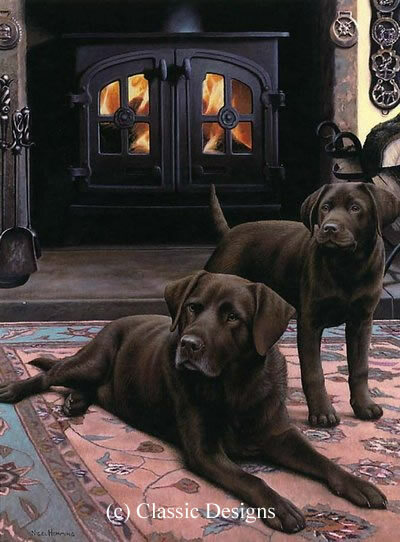 This lovely scene features a Chocolate Labrador and a puppy in front of the fire place, which is heart warming image anyway, fireplace or not! Nigelâ€™s award winning â€˜narrative style’ is of course ever present: whatâ€™s perked up these dogs interest? is the master going to take them out? Is it dinner time? Is someone at the door? So many questions come to mind and you canâ€™t help but smile. I feel this really shows the loveable beauty of the Labrador Retriever and their ever present inquisitive nature. I also love the detail in this picture, from the items on the wall in the background, the detail of the fireplace door, the fine dog hair, to the rug; there is so much for the eye to take in. Another classic Nigel Hemming image but hurry only 95 copies released worldwide! Our good friend and Top UK Canine artist, Nigel Hemming, has just released his latest limited edition piece called â€˜Yellow Cabâ€™ for the New Year 2009.
shame – because I cannot sell them. yellows is by no means as buoyant as it is for Blacks. I believe ‘Yellow Cab’ is a worthy addition to Nigelâ€™s huge range of published art. 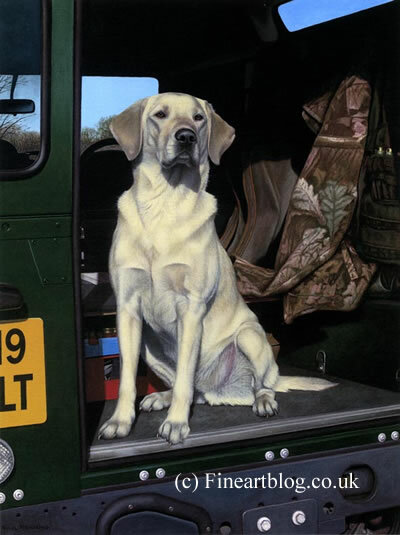 The images featuring Land Rovers appear to have an extra appeal to both Canine art lovers and indeed those who drive Lands Rovers. 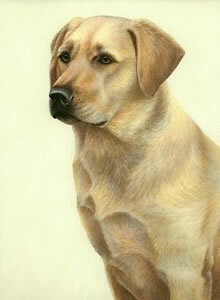 This is an extra special image, as Nigel hardly ever paints yellow labs into limited edition format. The excitement is now building as we are only 5 days away from one of the biggest Dog Art events of the year. For the first time ever UK artists Nigel Hemming and Steven Townsend will be appearing together in the same venue for a 2 man exhibition and appearance. I will personally be at the event and will publish a report soon after. Although I have been lucky enough to be in the company of Nigel Hemming several times, I have never met Steven Townsend and am very much looking forward to it. Iâ€™m sure this event will prove hugely successful, Nigel Hemming and Steven Townsend are arguably the most famous published canine artists in the UK and possibly the world. Out of interest, Nigel has become best known for his gun dog Limited Edition prints and Steven for both his border collie and wildlife Limited Edition prints. As you can see by the image in this blog post, Steven is also an accomplished landscape and seascape artist.